Following the Paris Agreement and related climate discussion, there has been a lot of focus on two thresholds: Limiting the global average temperature increase from human impacts to either 2°C or the more ambitious 1.5°C. But what would these changes actually mean to different regions of the world? Researchers looked at plant ecosystems in the Mediterranean Basin, using pollen cores to build models of the ecosystems since the last major ice age. Then they assessed the impact of four future climate change scenarios, ranging from an increase of 1.5°C to over 4°C. How different was this region in the past, and what changes can we expect in the future? The United Nations Framework Convention on Climate Change (UNFCCC) Paris Agreement of December 2015 aims “to hold the increase in the global average temperature to below 2°C above preindustrial levels and to pursue efforts to limit the temperature increase to 1.5°C.…” For many regions of the world, achieving the global 2°C target would still imply substantially higher average temperatures, with daily maxima reaching extreme values (1). Recent ~1°C warming has caused damage in many systems already today (2). The degree to which future damage could be avoided by ambitious warming thresholds is uncertain. Regional temperatures in the Mediterranean basin are now ~1.3°C higher than during 1880–1920, compared with an increase of ~0.85°C worldwide (Fig. 1). The difference between (global) warming of 1.5° and >2°C above preindustrial levels is critically important for adaptation policies in the Mediterranean region, notably with respect to land-use systems and the conservation of biodiversity. Simulations with impact models have shed some light on the risks and sensitivities to climate change, but they face limitations when applied at the regional scale and for low levels of warming (3). Fig. 1 Annual temperature change (from the preindustrial mean) versus CO2atmospheric concentrations. Colored boxes represent the Intergovernmental Panel on Climate Change RCP scenarios for 2010–2100 (25th, 50th, and 75th percentiles): RCP2.5 (green), RCP4.5 (orange), and RCP8.5 (red). Solid blue circles with vertical bars concern the same three scenarios for the Mediterranean region (10°W to 45°E, 28°N to 48°N). For the Holocene, the blue circles with cyan error bars (1σ) are derived from climate reconstructions from pollen for each century from 10,000 to 100 yr B.P. by steps of 100 years (4) (the variability is multiplied by a factor of 3 to account for the fact that the time resolution is 100 years instead of 10-year averages for the scenarios). The vertical bars represent the ±1 SDs provided by the reconstruction method. The medium-sized 1901–2009 circles are the Climatic Research Unit TS3.1 gridded observations (20) averaged in the same area and smoothed with a time step of 10 years. The vertical bars represent the corresponding SDs. The horizontal lines indicate the preindustrial mean temperature and the three thresholds referred to in the Paris Agreement (1.5°, 2°, and 3°C). The black regression line is based on the three global scenarios. ppmv, parts per million by volume. The X axis indicates the atmospheric CO2 concentration. Note that though there is a general trend that higher CO2 concentrations are correlated with later time periods, this does not necessarily mean two adjacent points are adjacent in time. For the Holocene period before 1901, the temperature changes are the outputs of the climate reconstruction based on the pollen cores, with each dot representing a 100 year slice of the 10,000 years examined. For 1901-2009, the temperature change is from a dataset of actual observations of temperature (and other climate variables) that have been gathered and combined in a resource called the Climatic Research Unite TS3.1. For future dates, the temperature outputs are from a set of over 20 climate models from the archive of the fifth phase of the Climate Model Intercomparison Project (CMIP5). The medium-sized blue circles at the left of the graph represent 100-year slices of time from 10,000-100 years B.P., and indicate the difference of the temperature in the Mediterranean region at that time compared to the global pre-industrial temperature average. The thin cyan error bars indicate the variability–these are based on standard deviation, like the 1901-2009 points, but multiplied by three to reflect the larger time frame covered per dot. The Holocene has been noted for its stability of climate. How is this reflected in this grouping? These dots are specific to the Mediterranean region. What does their position compared to the global pre-industrial temperature mean indicate? The term "outlier" describes a data point that is at an abnormal or unusual distance from other values in a random sample. There is an outlier from this group–can you find it? The small blue dots are based on actual observed temperatures in the Mediterranean region. As with the earlier data points, the error bars reflect variability based on standard deviation. Note that the data points have a much larger spread across the X axis. How does the variability of these data points compare to the earlier Holocene points? The future scenarios are represented in several different ways. The three different emissions pathways were modeled and the data for the last decade of the 21st century, 2090-2100, is presented here. The global average temperature results are indicated by the colored dots and rectangles, with the dot showing the median result from the models, and the top and bottom of the box indicating the 25th and 75th percentile results. The blue dots that line up with these boxes represent the temperature results of the Mediterranean region for those same scenarios. The pathway with the lowest emissions, RCP2.6, is in green. RCP4.5, an intermediate pathway, is in orange. RCP8.0, the pathway with the highest emissions, is in red. How do the Mediterranean data points compare to the global data points? To assess the regional effects of different Paris Agreement thresholds for the Mediterranean basin, the Holocene reconstruction of spatiotemporal ecosystem dynamics from pollen allows the development of reliable scenarios of climate-driven change in land ecosystems (4). Despite the effects of human land use, broader-scale past ecosystem dynamics have been mostly driven by regional climate change. Mediterranean basin ecosystems are a hot spot of the world’s biodiversity (5) and supply numerous services to people, including clean water, flood protection, carbon storage, and recreation. Thus, the broad-scale vulnerability of ecosystems to climate change can be used as an indicator of the importance of the warming thresholds identified by the Paris Agreement for the environment and human well-being. Given the confidence with which past ecosystems and climate change can be reconstructed from numerous pollen profiles, the development and validation of more reliable numerical models for the ecosystem-climate relationship have become possible. We apply such an approach to future climate conditions, using simulations from the Coupled Model Intercomparison Project phase 5 (CMIP5) for three different greenhouse gas (GHG) forcings [see table S2 and (6) for details]. An analysis of the annual mean temperatures for these three scenarios for all climate models at the global and Mediterranean scale, an observational time series, and a spatiotemporal historical reconstruction at the Mediterranean scale (Fig. 1) indicate that (i) the projected warming in the Mediterranean basin exceeds the global trend for most simulations; (ii) the first decade of the 21st century has already surpassed the Holocene temperature variability; (iii) the global warming, but also the regional warming, is approximately a linear function of the CO2concentration; and (iv) only a few simulations provide global warming lower than 2°C at the end of the 21st century. Mediterranean land ecosystems are sensitive not only to warming but also to changes in water availability. Even if past variations in precipitation and their projections for the future are spatially more heterogeneous than temperature fields (7), for most scenarios, the changes in both fields will combine to reduce water availability and trigger losses of Mediterranean ecosystems and their biodiversity during the coming decades (8–10). During the Holocene (especially in the second half of this epoch), periods of precipitation deficits have occurred, but in contrast to the 21st-century situation, temperatures did not rise above the present average (Fig. 1) (4). These periods of precipitation deficits [~6 to ~5.2, ~4.2 to ~4, and ~3.1 to ~2.9 thousand years before the present (yr B.P.)] have been identified as possible causes of declines or collapses in civilization in the eastern Mediterranean region (11–13). A recent study (14) has attributed important crop failures in Syria to two strong drought episodes—characterized by a lack of precipitation (reduced by up to 30% in the 6-month winter season) and high temperatures (warming of 0.5° to 1.0°C in the annual mean relative to the 20th-century average)—in the eastern Mediterranean between 1998 and 2010. The 1998–2012 period was the driest of the last 500 years (15). Even if societal factors have likely been the primary causes of these crises (16, 17), Holocene droughts and the associated variability in land productivity may have also played a role, indicating the potential effect of climate change on agriculture-based economies. To relate the past variability of climate and ecosystems with possible future conditions, we use the process-based ecosystem model BIOME4 (6), which, when compared with correlation techniques, allows a more reliable reconstruction of past climate-vegetation equilibria. Direct human impacts, such as the cultivation of crops or degradation processes, are not taken into account. For the Holocene, BIOME4 was inverted to generate gridded climate patterns by time steps of 100 years and associated ecosystems (“biomes”) from pollen records (4). For the future, the forward application of the same model yields ecosystem distributions from climate projections (6). The limitations of a relatively simple ecosystem model are largely offset by two factors. First, this method directly relates the physical environment, including its seasonal variability, and atmospheric CO2 to plant processes and thereby avoids the strong assumptions made by niche models (18). Second, past observations are analyzed with the same process-based model that is used for the future projections, thus providing a more coherent framework for the assessment. Video. Why is pollen such a good indicator of past ecosystems? Learn more in this video from Science. 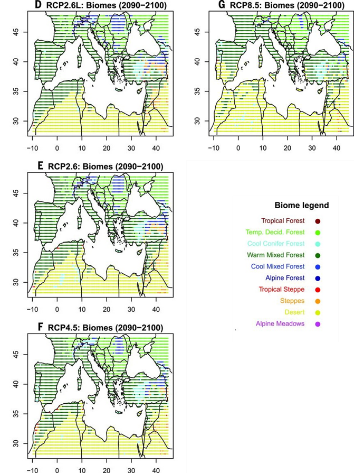 Figure 2 indicates reconstructed and estimated shifts in the distribution of major Mediterranean biomes (temperate conifer forest, deciduous forest, warm mixed forest, xerophytic shrubland, and steppe) over time for the past and future, relative to their current distribution. During the Holocene, only up to 15% of the land has had different ecosystems from those existing today at any moment. The 10% level was exceeded only during eight 100-year time slices, and all of these periods occurred before 4200 yr B.P. All of these were relatively humid periods, which became less frequent after this date (4). The past four millennia, and notably the past century, were generally dry compared with the first half of the Holocene. Fig. 2 Proportion of grid cells with a biome change relative to the preindustrial period for the Mediterranean area (10°W to 45°E, 28°N to 48°N). The horizontal axis represents the time scale, in years before the present (20th century) for the past (negative numbers) and in years after the present (CE 2000–2010) for the future (positive numbers). Holocene biomes (in black) are based on reconstructions from pollen data (4). Colored lines are given by the BIOME4 model as applied to the RCP projections (see text). Horizontal lines represent the 50th, 80th, 90th, and 99th percentiles of the Holocene values. The colored areas illustrate the interquartile interval provided by the intermodel variability. In this graph, the X axis indicates time – but note that the scale changes. It centers at the current time, marked as 0 on the axis, which represents 2000-2010. To the left, in negative years, is the past 10,000 years of the Holocene, cut up into 100-year periods. To the right is the future, covering just 100 years. The Y axis is the ratio of change for the five major biomes (temperate conifer forest, deciduous forest, warm mixed forest, xerophytic shrubland, and steppe), compared to the present distribution. For the Holocene section, the data come from the BIOME4 “inverted” analysis of the pollen core data. For each time slice, the five major biomes were compared to the present scenario to determine the change ratio – for example, if 10% of the biomes were different, that would be a change ratio of 0.10. The lines for the future scenarios are based on running the BIOME4 model in “forward” mode – putting in climate data and CO2 concentrations based on the different emissions scenarios for each year through 2100, and comparing the resulting biome distribution to the current scenario. For the past, the change ratio for each 100-year slice is shown by a black bar. What patterns of variation do you notice? For the next figure, the researchers picked one of the Holocene slices to represent the past. Looking at this figure, which timepoint would you use to represent the past, if you needed to choose one? Four future scenarios are modeled. The blue line uses the RCP2.6L pathway that was developed for this study, to have a pathway that fits the 1.5°C threshold. The green pathway is RCP2.6, which fits the 2.0°C threshold pathway. The orange pathway, RCP4.5, and the red pathway, RCP8.5, both have temperature increases above 2.0°C. All four scenarios show similar results until around 2030. Compare the different colored pathways, including the shaded areas to the horizontal lines that show the percentiles of the Holocene results. What does this indicate about the future scenarios compared to the past variations in biomes? The future is represented by the following three classes of simulated time-space fields of temperature and rainfall, which are derived from the CMIP5 project (table S2): Representative Concentration Pathway 8.5 (RCP8.5) (22 simulations), RCP4.5 (23 simulations), and RCP2.6 (16 simulations). RCP2.6 approximates the 2°C target. To assess the 1.5°C target, we created a fourth class (denoted RCP2.6L) from selected CMIP5 scenarios [see (6) for details]. Up to 2030, all four classes generate similar ecosystem distributions and generally remain within the bounds of Holocene fluctuations. By the end of the 21st century, RCP2.6L remains in the range of the 80th and 99th percentiles of the Holocene, whereas RCP2.6 simulates Mediterranean ecosystems as they were during the most extreme period of the Holocene (at 4700 yr B.P. ), with a change of 12 to 15%. The limits of the Mediterranean vegetation types defined by biogeographers (19) broadly coincide with our simulated warm mixed forest biome (Fig. 3A), with the following two exceptions: (i) Simulated warm mixed forests also extend to the Atlantic Ocean in the west of France, indicating the inability of BIOME4 to distinguish Atlantic pine forests, and (ii) the narrow strip of Mediterranean vegetation on the Libyan and Egyptian coast, which is below the spatial resolution of our climatic data. The reconstruction for the period of the Holocene (4700 yr B.P.) (Fig. 3B) with the greatest difference from today (Fig. 3A) shows that the main differences are related to the further regression of forested areas in the southern Mediterranean associated with expanding desert areas. Fig. 3 Mediterranean biome maps. 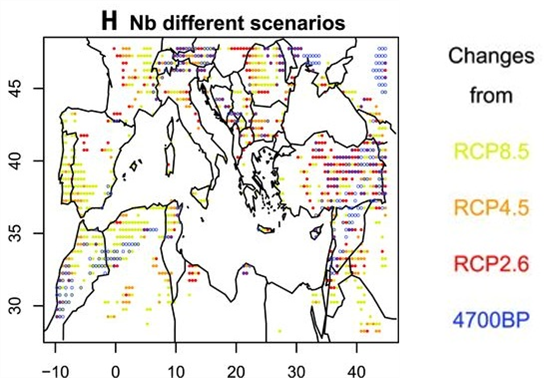 Distribution of Mediterranean biomes (A) reconstructed (rec) from pollen for the present; (B) reconstructed from pollen for 4700 yr B.P. ; (C) simulated by the BIOME4 model for the present; and (D to G) for scenarios RCP2.6L, RCP2.6, RCP4.5, and RCP8.5, respectively, at the end of the 21st century. For the simulations, each point indicates the most frequent biome in the ensemble of CMIP5 climate simulations. Map (H) indicates, for each point, the number of scenarios different from the simulated present. Yellow areas indicate when only RCP8.5 is different; orange areas denote when RCP4.5 and RCP8.5 are different; red areas indicate when RCP2.6, RCP4.5, and RCP8.5 are different; and blue circles mark areas in which the biome type at 4700 yr B.P. is different from the present biome type. 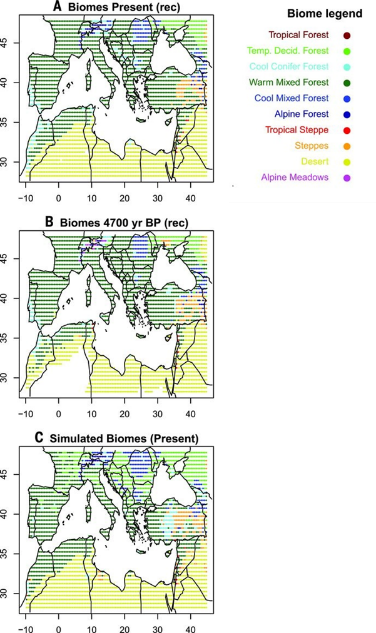 This figure shows the modeled biomes for each of the grid points across the Mediterranean Basin land mass. The data come from the BIOME4 model, run in two different ways. The first two were generated from the “inverse” mode, with pollen core data being the input. The next five maps were generated using the “forward” mode, putting in climate data to get out the biome types. The last map was generated by comparing the differences between certain maps. Note that the colors do not indicate the same information as in the earlier maps. This figure has a lot of information; see the next three tabs to break it down. The first set of maps to look at are the past and present maps. There are two “present” maps. The first, 3A, was generated using the “inverse” BIOME4 model where the input is the pollen cores. This is the same way the 4700 B.P. map was generated. The second map, 3C, was generated using the “forward” BIOME4 model, putting in climate data to generate the biomes. This is the method used for the future scenarios, and this is the data set that is compared to the future scenarios for the last map. How similar are the past and present maps? Are there patterns to where the differences are? Maps 3D-3G all show future scenarios of what the biomes would look like in the last decade of the century. These cover a range of average global temperature increases from 1.5°C to about 4°C. How similar are these to each other? To the past and present maps? Are there patterns to where the differences are? The last map shows differences between maps. What are the patterns of change? What does this indicate about the location and type of changes that might be expected? Simulations for the RCP2.6L and RCP2.6 scenarios do not change biome distributions much at the end of the 21st century (Fig. 3, D to E). However, for the same period, the RCP4.5 scenario induces desert extension toward North Africa, the regression of alpine forests, and the extension of Mediterranean sclerophyllous vegetation. Under the RCP8.5 scenario, all of southern Spain turns into desert, deciduous forests invade most of the mountains, and Mediterranean vegetation replaces most of the deciduous forests in a large part of the Mediterranean basin. Figure 3H illustrates the variation from areas without any changes, regardless of scenario (stable white areas), to areas in which changes from scenario RCP2.6 already appear (red areas). As expected, the most-sensitive areas are those located at the limit between two biomes—for example, in the mountains at the transition between temperate and montane forest or in the southern Mediterranean at the transition between forest and desert biomes. The map for 4700 yr B.P., in which the past changes were among the highest (Fig. 3B), has the largest changes in the southwest, eastern steppe areas, and the mountains, but these changes are relatively sparse. Our analysis shows that, in approximately one century, anthropogenic climate change without ambitious mitigation policies will likely alter ecosystems in the Mediterranean in a way that is without precedent during the past 10 millennia. Despite known uncertainties in climate models, GHG emission scenarios at the level of country commitments before the UNFCCC Paris Agreement will likely lead to the substantial expansion of deserts in much of southern Europe and northern Africa. The highly ambitious RCP2.6 scenario seems to be the only possible pathway toward more limited impacts. Only the coldest RCP2.6L simulations, which correspond broadly to the 1.5°C target of the Paris Agreement, allow ecosystem shifts to remain inside the limits experienced during the Holocene. This analysis does not account for other human impacts on ecosystems, in addition to climate change (i.e., land-use change, urbanization, soil degradation, etc. ), which have grown in importance after the mid-Holocene and have become dominant during the past centuries. Many of these effects are likely to become even stronger in the future because of the expanding human population and economic activity. Most land change processes reduce natural vegetation or they seal or degrade the soils, representing additional effects on ecosystems, which will enhance, rather than dampen, the biome shifts toward a drier state than estimated by this analysis. This assessment shows that, without ambitious climate targets, the potential for future managed or unmanaged ecosystems to host biodiversity or deliver services to society is likely to be greatly reduced by climate change and direct local effects. S. I. Seneviratne, M. G. Donat, A. J. Pitman, R. Knutti, R. L. Wilby Allowable CO2 emissions based on regional and impact-related climate targets. Nature 529, 477–483 (2016). W. Cramer et al., in Climate Change 2014: Impacts, Adaptation, and Vulnerability. Part A: Global and Sectoral Aspects. Contribution of Working Group II to the Fifth Assessment Report of the Intergovernmental Panel on Climate Change, C. B. Field et al., Eds. (Cambridge Univ. Press, 2014), pp. 979–1037. J. Guiot, D. Kaniewski, The Mediterranean Basin and Southern Europe in a warmer world: What can we learn from the past? Front. Earth Sci. 3, 28 (2015). F. Médail, N. Myers, in Hotspots Revisited: Earth’s Biologically Richest and Most Endangered Terrestrial Ecoregions, R. A. Mittermeier et al., Eds. (Conservation International, 2004), pp. 144–147. E. Xoplaki, J. F. González-Rouco, J. Luterbacher, H. Wanner, Wet season Mediterranean precipitation variability: Influence of large-scale dynamics and trends. Clim. Dyn. 23, 63–78 (2004). L. Maiorano, A. Falcucci, N. E. Zimmermann, A. Psomas, J. Pottier, D. Baisero, C. Rondinini, A. Guisan, L. Boitani, The future of terrestrial mammals in the Mediterranean basin under climate change. Philos. Trans. R. Soc. London Ser. B 366, 2681–2692 (2011). T. Keenan, J. Maria Serra, F. Lloret, M. Ninyerola, S. Sabate, Predicting the future of forests in the Mediterranean under climate change, with niche- and process-based models: CO2 matters! Glob. Change Biol. 17, 565–579 (2011). W. Thuiller, S. Lavorel, M. B. Araújo, Niche properties and geographical extent as predictors of species sensitivity to climate change. Glob. Ecol. Biogeogr. 14, 347–357 (2005). B. Weninger, L. Clare, E. Rohling, O. Bar-Yosef, U. Böhner, M. Budja, M. Bundschuh, A. Feurdean, H. G. Gebe, O. Jöris, J. Linstädter, P. Mayewski, T. Mühlenbruch, A. Reingruber, G. Rollefson, D. Schyle, L.Thissen, H. Todorova, C. Zielhofer, The impact of rapid climate change on prehistoric societies during the Holocene in the Eastern Mediterranean. Doc. Praehist. 36, 7–59 (2009). D. Kaniewski, E. Van Campo, H. Weiss, Drought is a recurring challenge in the Middle East. Proc. Natl. Acad. Sci. U.S.A. 109, 3862–3867 (2012). N. Roberts, D. Brayshaw, C. Kuzucuoglu, R. Perez, L. Sadori, The mid-Holocene climatic transition in the Mediterranean: Causes and consequences. Holocene 21, 3–1 (2011). C. P. Kelley, S. Mohtadi, M. A. Cane, R. Seager, Y. Kushnir, Climate change in the Fertile Crescent and implications of the recent Syrian drought. Proc. Natl. Acad. Sci. U.S.A. 112, 3241–3246 (2015). J. Geophys. Res. 121, 2060–2074 (2016). G. Middleton, Nothing lasts forever: Environmental discourses on the collapse of past societies. J. Archaeol. Res. 20, 257–307 (2012). A. B. Knapp, S. W. Manning, Crisis in context: The end of the Late Bronze Age in the Eastern Mediterranean. Am. J. Archaeol. 120, 99–149 (2016). C. B. Yackulc, J. D. Nichols, J. Reid, R. Der, To predict the niche, model colonization and extinction. Ecology96, 16–23 (2015). C.Roumieux et al., Actualisation des limites de l’aire du bioclimat méditerranéen selon les critères de Daget (1977). Ecol. Mediterr. 36, 17–24 (2010). I. Harris, P. D. T. J. Osborn, D. H. Lister, Updated high-resolution grids of monthly climatic observations - the CRU TS3.10 dataset. Int. J. Climatol.34, 623–642 (2014). J. O. Kaplan et al., Climate change and Arctic ecosystems: 2. Modeling, paleodata-model comparisons, and future projections. J. Geophys. Res. 108 , 8171 (2003). S. P. Harrison, C. I. Prentice, Climate and CO2 controls on global vegetation distribution at the Last Glacial Maximum: Analysis based on paleovegetation data, biome modelling and paleoclimate simulations. Glob. Change Biol. 9, 983–1004 (2003). J. Blondel, J. Aronson, J. Y. Bodiou, G. Boeuf, The Mediterranean Region: Biological Diversity Through Time and Space (Oxford Univ. Press, ed. 2, 2010). P. E. Tarasov, R. Cheddadi, J. Guiot, S. Bottema, O. Peyron, J. Belmonte, V. Ruiz-Sanchez, F. Saadi, S.Brewer, A method to determine warm and cool steppe biomes from pollen data; application to the Mediterranean and Kazakhstan regions. J. Quat. Sci. 13, 335–344 (1998). A. Indermühle, T. F. Stocker, F. Joos, H. Fischer, H. J. Smith, M. Wahlen, B. Deck, D. Mastroianni, J.Tschumi, T. Blunier, R. Meyer, B. Stauffer, Holocene carbon-cycle dynamics based on CO2 trapped in ice at Taylor Dome, Antarctica. Nature 398, 121–126 (1999). K. E. Taylor, R. J. Stouffer, G. A. Meehl, An overview of CMIP5 and the experiment design. Bull. Am. Meteorol. Soc. 93, 485–498 (2012). M. Meinshausen, S. J. Smith, K. Calvin, J. S. Daniel, M. L. T. Kainuma, J.-F. Lamarque, K. Matsumoto, S. A. Montzka, S. C. B. Raper, K. Riahi, A. Thomson, G. J. M. Velders, D. P. P. van Vuuren, The RCP greenhouse gas concentrations and their extensions from 1765 to 2300. Clim. Change 109, 213–241 (2011). J. Guiot, F. Torre, D. Jolly, O. Peyron, J. J. Boreux, R. Cheddadi, Inverse vegetation modeling by Monte Carlo sampling to reconstruct paleoclimate under changed precipitation seasonality and CO2 conditions: Application to glacial climate in Mediterranean region. Ecol. Modell. 127, 119–140 (2000).